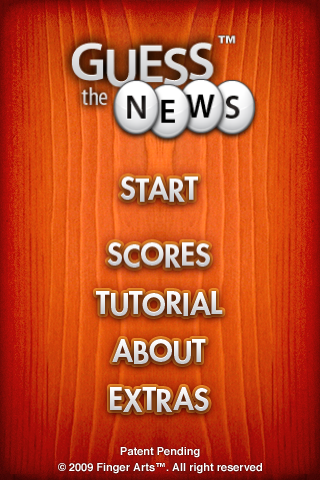 Guess the News is an iPhone word game that is both educational and fun at the same time. It is something like the game show wheel of fortune where you have to guess the letters to a particular sentence or phrase. Guess the News follows that concept but with a delightful twist. 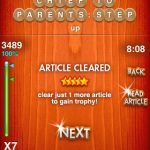 Instead of guessing from a fixed set of words and phrases, the game allows players to guess the headline titles of latest news retrieved from various different news websites. These news relates to the real ongoing world of course and as you play the game and guess the title, you can choose to read the article if the headline title appeals to you. Therefore this is no longer just a word game. Instead it is a hybrid of a news informer and a game by itself. A very smart and brilliant concept I must admit. This makes people who do not like reading news know at least the headline news of the current world. For example, you play one of the levels and the title you guessed correctly is “Earth Quake at swift world”, you will most probably know what exactly is going on around the world. 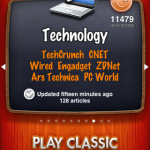 The news articles are retrieved from various sites via the internet, therefore it is necessary for first timers to connect to the internet and let the game update. By updating the content of the game through the internet and news websites, the titles will never ever be the same. You can play the game for hours and hours, days after days without actually having to guess the same old thing again (this is only untrue when the world stays stagnant or world peace is obtained). 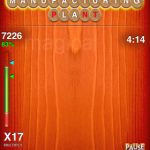 A very smart way of making the game stay fresh in terms of a word game for a long time. 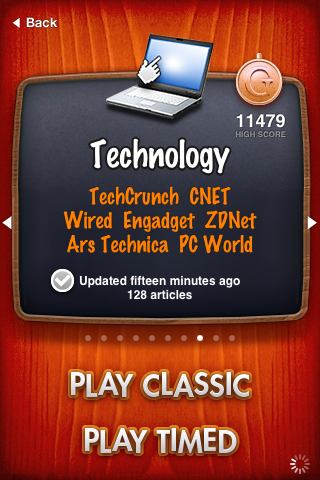 The game allows you to choose from different category of news. Therefore if you’re a computer and tech wiz you might want to take a look at the technology category where the titles you are guessing are related with the tech world. If you’re more interested in the latest gossip about your favourite movie star, take a look at the entertainment category. There’s a category for every single person and the titles you guess will most probably interest you to find out more and update yourself with the latest buzz around the world. 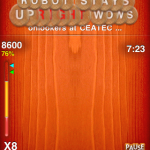 Upon choosing a category, players can decide to take on the levels by deciding on 3 difficulty levels on two different modes. They range from easy, medium to hard. Easy is rather easy with many words and letters already filled up for you. All you’ve got to do is to sort out the remaining few letters to form a word that is recognizable. Medium is slightly harder where you are placed into a situation where there are much more blanks in the title you are guessing. Challenging but not as much as that of the hard difficulty. The hard difficulty is hard. Every word of the title you guess will have a various number of letters to choose from, resulting in a low probability of guessing it correctly. Therefore you really must know what the news is about before actually being able to attempt to guess correctly. There are two modes present within the game. The Classic and the Timed mode. For the Classic mode, you have no worries of a clock ticking down. Take your time to guess correctly but remember the faster you guess the words right, the more points you get. 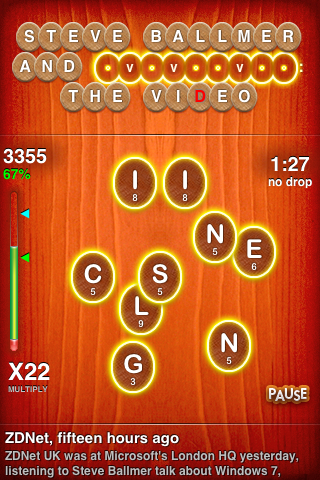 The Timed mode is where you try your best to guess the most number of words within a given time. The faster you guess the title correctly, the more time you have for the next article. 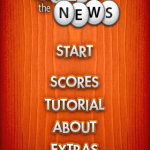 The game plays with player selecting the word of the news title they want to guess and then they are provided with a number of letters to choose from (Yes, there is no need for you to choose from A – Z for each word, letters are given). They then either choose to drag the letters onto the blank spaces or rather double tapping the letters in sequence to let them fly immediately to the blanks. As said earlier, only the hard difficulty puts players into a situation where there are more letters than the blanks, resulting in a lower chance of guessing correctly. 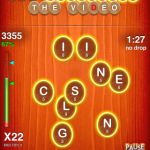 The faster you are able to guess the word correctly, the more points you score due to the score multiplier. 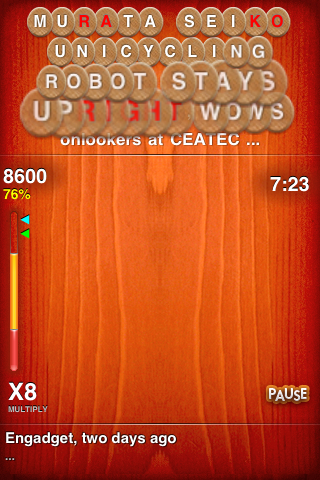 As time passes, the multiplier will slowly drop from a higher multiple to a lower one. To proceed to the next article, you must meet the requirements of a certain percentage of correct words. Therefore make sure you think through before guessing for incorrect words will lower your chances of succeeding. 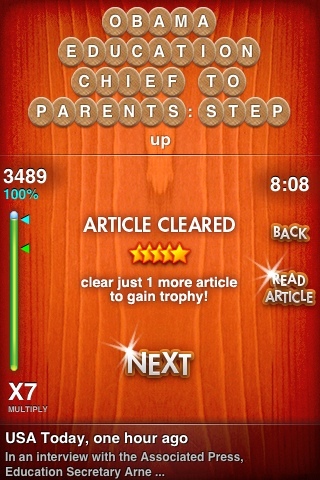 Once a title is guessed, the game pauses to allow players to choose whether to continue or actually go to the article itself to read up more about it. This is where the knowledge and education comes from. A very neat idea. Once you finish a specific amount of titles in succession, you get a medal for that particular category depending on the difficult you have selected. Once you’re done with that difficulty, you can always try again for fun, knowledge or simply to make that high score higher. Some issues with the game I’ve met through the play through are that sometimes the game retrieves the title of the article with some of the HTML tags still in place. For example there was a title where I saw the <i> </i> tags there in within the title. Also, another problem is the game should find some way to determine what words ought to be given and what shouldn’t for there are many a times complex words such as names, places and perhaps a sort of lingo or slang within the title. This makes the game a little more frustrating at times for sometimes you simply do not know how to spell that Japanese developer for that particular game at all. The game has no sound or music at all. At least it lets you play your own music, but maybe a little more sound effects maybe? A suggestion maybe to allow players to decided which sites they want their news article from? That would be way cool to let myself guess the latest headlines from SwiftWorld. Its currently out for the US store only but it promises to reach your local app store soon. It is sold at a special offer of $0.99 now (soon to be $2.99) and I definitely recommend it to all. 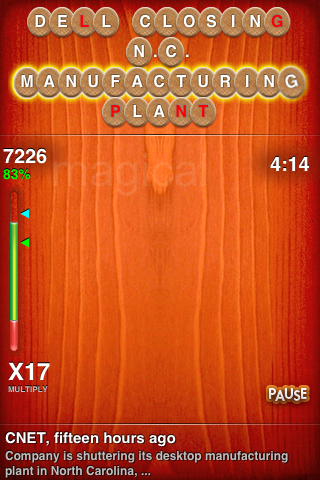 If you’re a word puzzle game sort of fan, you have to grab it now. Thank you for an awesome review! We are thrilled to know that you enjoy playing GtN. You help your readers understand the game through your talented writing style! Just so you know, we already submitted our next version 1.5 to Apple. The new version will contain music and sounds 🙂 Additionally, we improved the interface and added International RSS news feeds from all English speaking countries, Italy, Germany, France, Spain and Brazil. P.S. Polar bears are my favorite animals, too! Yup very innovative. For the innovation and creativity, it deserves to be rated 9/10. Besides it is really that fun.